KMT Waterjet. Abrasive Waterjet Intensifier Pump. 90,000psi. 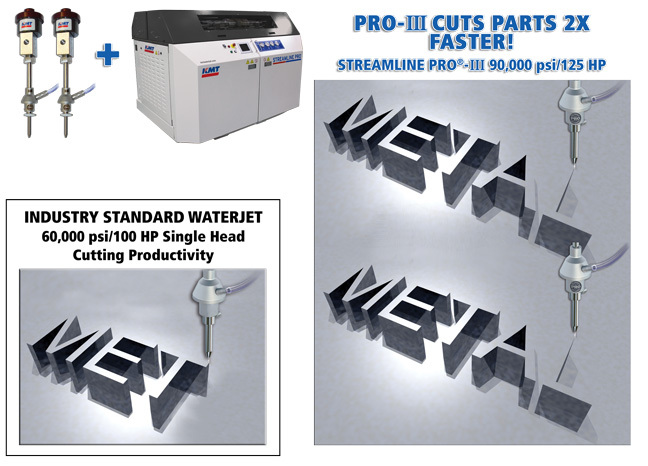 KMT Waterjet STREAMLINE PRO®-III Series 90,000 PSI/6,200 bar Pumps: WORLD'S FASTEST WATERJET! Since 1971, KMT Waterjet has been devoted to pioneering and engineering the most efficient intensifier pumps for use with waterjet technology. KMT Waterjet Systems has the broadest range of abrasive waterjet intensifier pumps with the introduction of the Ultra High Pressure (UHP) KMT STREAMLINE PRO®-III Series 90,000 PSI/6,200 bar Waterjet Pump. The PRO-III 60 HP Pump will significantly increase cutting productivity by 50 - 70% over industry standard 60,000psi (4,137 bar)/50hp cutting speeds. The PRO-III 125 HP Pump delivers the abrasive waterjet tables twice the power, by cutting products in up to half the time over conventional 60,000 PSI (4,137 bar)/100 HP water jet machining systems. The KMT Rapid Seal Change intensifier pump design technology and is perfect for high volume production from single head to multiple abrasive waterjet cutting head requirements and for intricate detailed cutting with tight tolerance requirements. MAXIMUM PERFORMANCE, MAXIMUM POWER, FASTEST CUTTING!